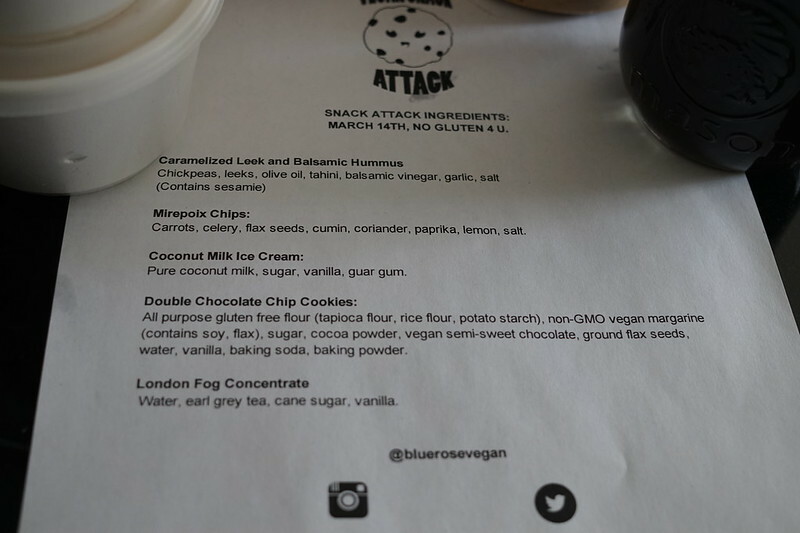 Blue Rose Vegan Baking Co. & the Vegan Snack Attack – Edmonton – vegan in your city. After our visit to Clever Rabbit on our Roadtrip Adventure – we decided to check out a little market that was happening down the street called Eden’s Market. 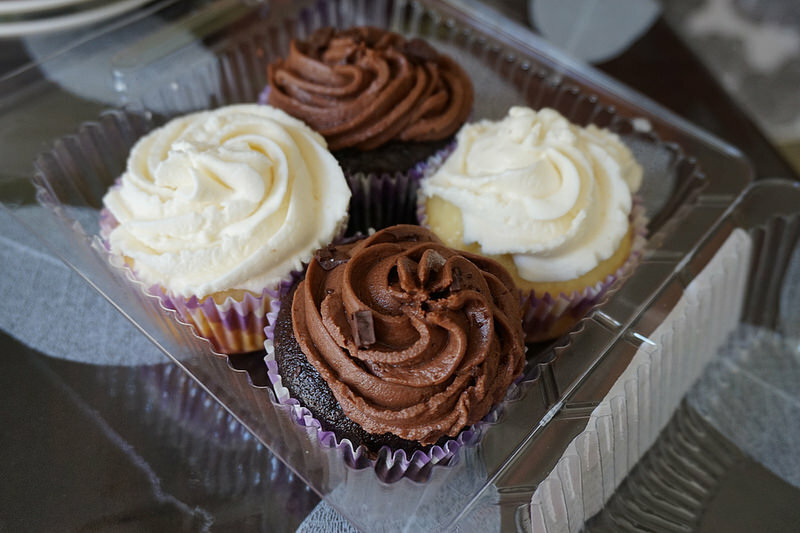 There were a variety of vendors, but we made a B-line to Blue Rose Baking Co, because I’ve followed the owner, Sarah Louise and her blog The Cozy Vegan on The Twitters since before she moved to Edmonton from Calgary. 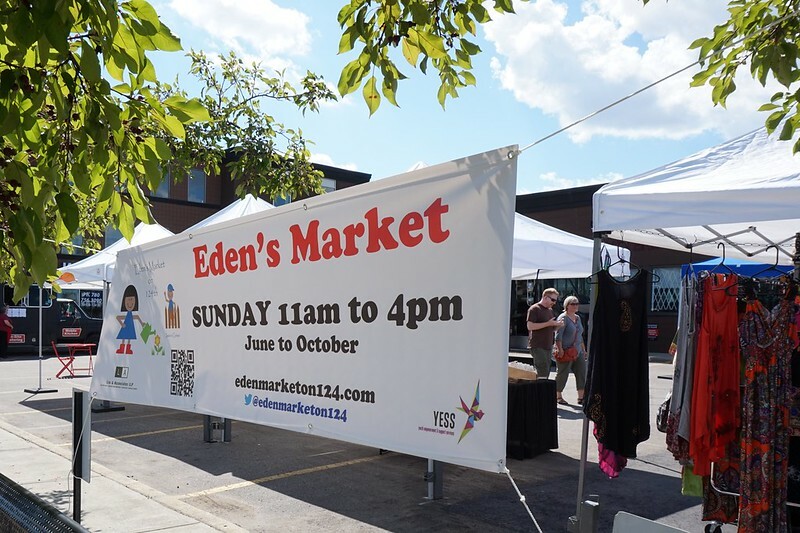 Sadly, since our visit Eden’s Market has closed permanently due to lack of traffic, which is too bad, because I liked that they were also supporting the Youth Emergency Shelter Society with their market. 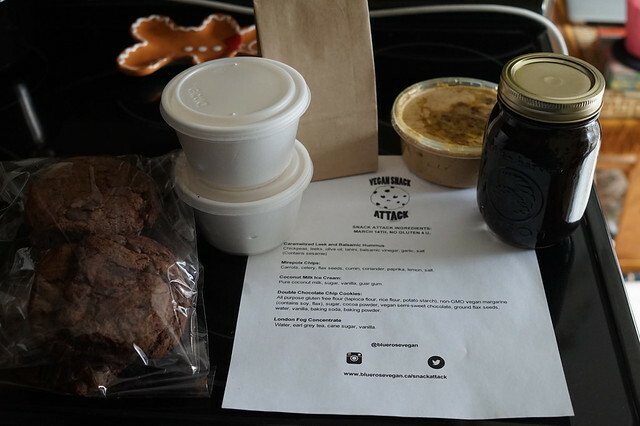 On a more recent visit to Edmonton I had the wherewithal to pre-order a Vegan Snack Attack box from The Mercury Room and Blue Rose Baking Co. And I highly recommend you do so too. My visit coincided with the 100% Gluten-Free box, so I was a bit hesitant, but it turned out alright and delicious in the end. These two talented local vegan bakers and makers have teamed up to create Edmonton’s very own vegan snack attack box – every box features handcrafted treats both savoury and sweet, with something for everyone in the box – which is true, I ordered a Valentine’s Day special delivery box for my parents earlier this year – and they seemed to really enjoy it too. For myself though – I ordered the Notorious B.I.G box, which offers a bunch more snacks than the 2pac, because since I was only going to get one go at this Vegan Snack Attack box, I was going to do it right. 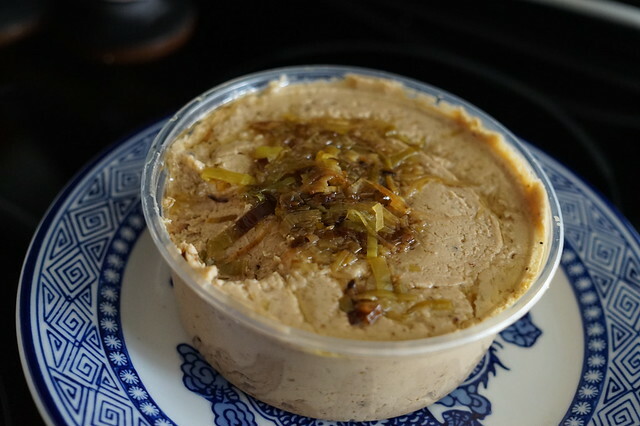 Well – there was a thick and savoury Caramelized Leek and Balsamic Hummus. And it was like a gourmet party in my mouth, also possibly the most fancy flavoured hummus I’ve ever had then and since. Really though, I could have happily eaten it with a spoon everyday forever. But sadly and expectedly, it disappeared quickly. 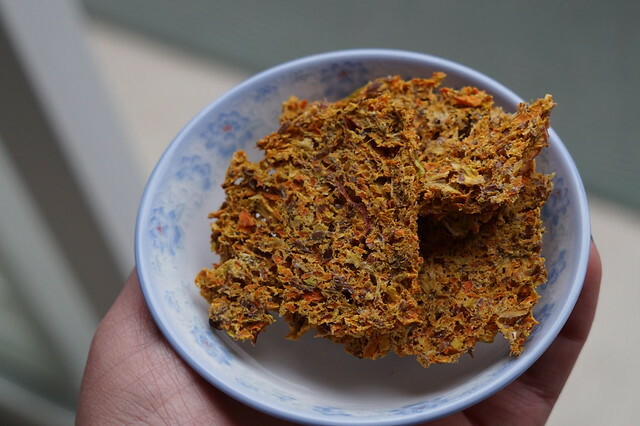 The mirepoix chips were chips made from a variety of dehydrated veggies, and were quite fragile. Or rather, they were just too fragile to dip into the thick delicious hummus. I’ll admit ambivalence to these chips – but only because I wanted desperately to scoop hummus with them, without much success. Otherwise, they were tasty. There were a bunch of other things in my Vegan Snack Attack box. The gluten-free double chocolate cookies were actually pretty great, much to my delight. 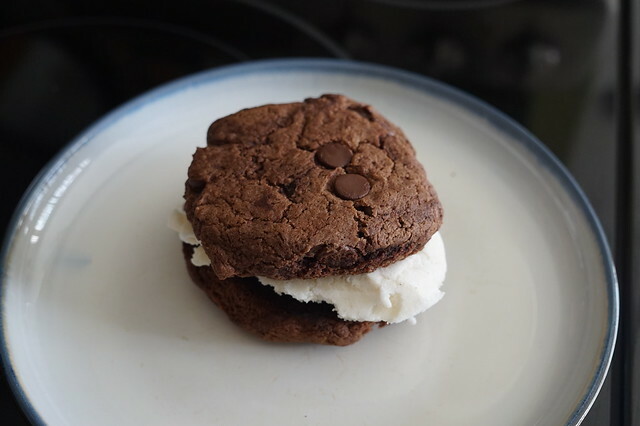 I made myself and my mom ice cream sandwiches (from the enclosed coconut ice cream). Which continues to live in my fridge. To this day. But it’s still good. Real good. Next time, I’m going to pour some in a batch of cookies for instant London Fog Cookie time. I’m not sure if the YEG Vegan Snack Attack Box is still going on, but if it is, you can find out more about it at Blue Rose Vegan’s site over here. Blue Rose Vegan Baking Co.
Blue Rose Baking, clever rabbit, Vegan Snack Attack Box. Bookmark. Things I Love Thursday – Martha.